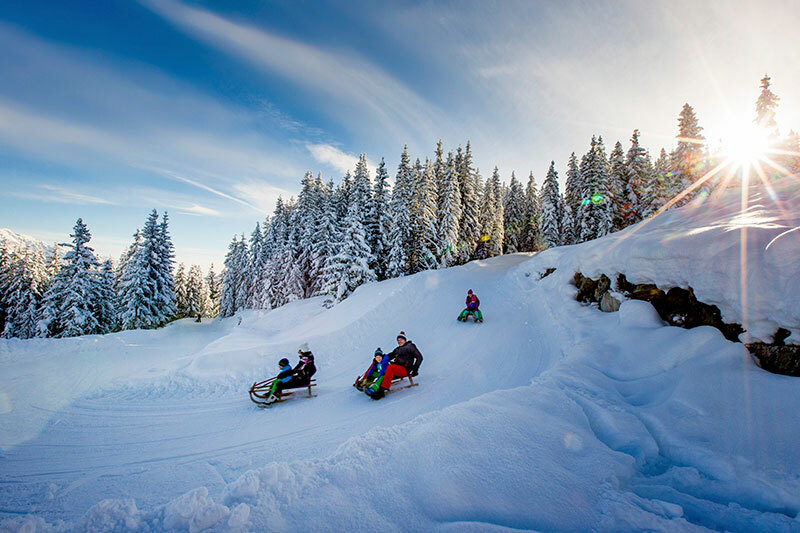 Idyllic Filzmoos is the perfect place for anyone looking for winter fun in a charming Austrian village, without necessarily being an avid skier. 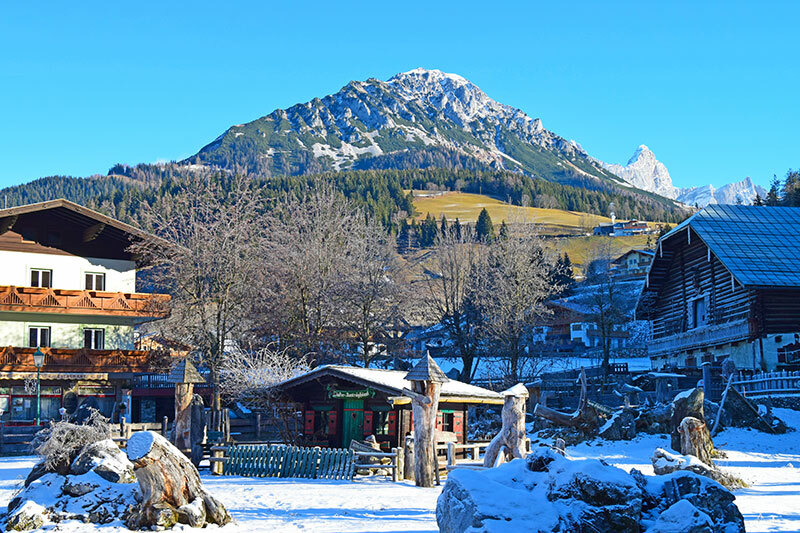 Although Filzmoos had received the first snow when we arrived in early December and was partly dressed in white, the landscape had more of a spring feeling to it. This was by no means disappointing, as it meant sun from blue sky and enjoyable temperatures. Thus, perfect conditions for winter hiking and horse-carriage trips. 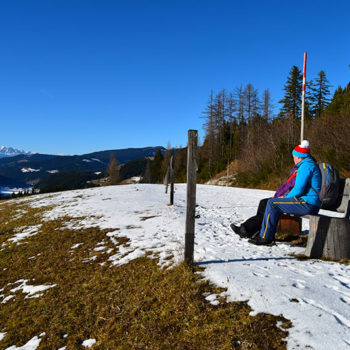 Travellers have started to recognise the delight of winter hiking. As a consequence many tourist destinations around Austria are well set up for non-skiing tourists. 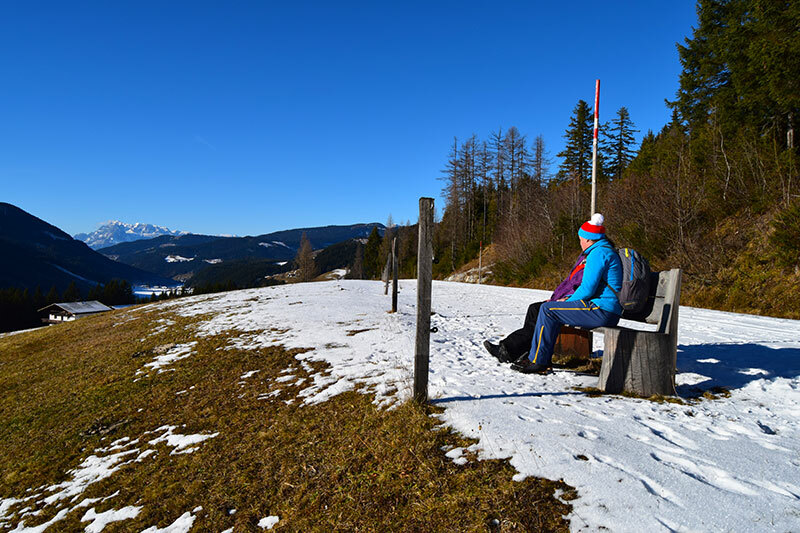 According to our Filzmoos hiking guide Edi Vierthaler, as many as 30-40 % of the visitors to Filzmoos in the winter are looking for other activities than skiing. Edi took us on a lovely hike for 2 ½ hours around Filzmoos. At a leisurely pace, on either forest roads or hiking trails, including a pit stop for some hot drinks, there was ample time to enjoy the surroundings. 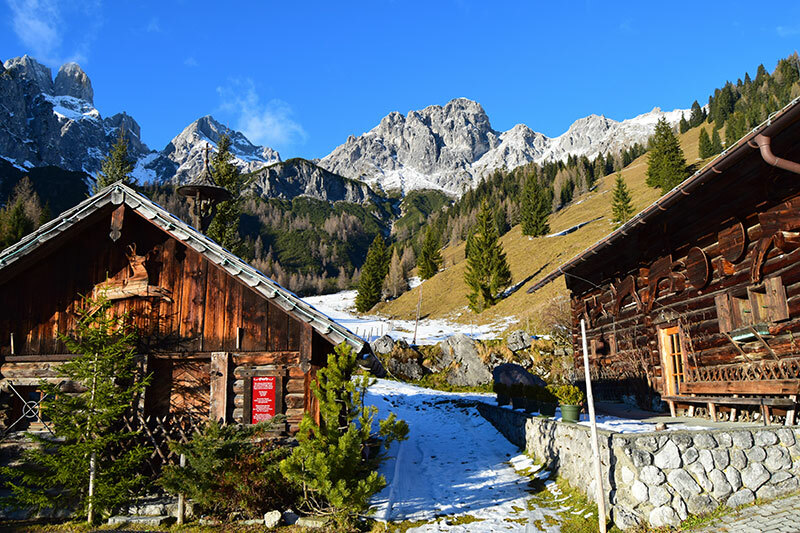 The clear weather meant brilliant views of the Alps and especially the nearby peaks of the Dachstein Mountains. 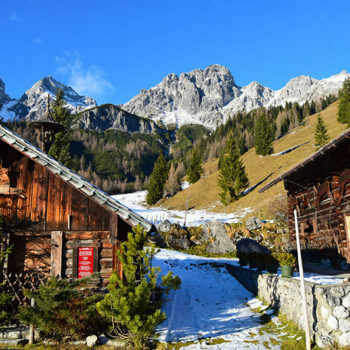 Another highlight of our visit to Filzmoos was the horse-carriage excursion to Unterhof Alm. An old alpine dairy about one hour from Filzmoos. Trotting along the forest road, the horses brought us through the forest and to the foot of the 2458-meter high Bischofsmütze. What we found was stunning views of a fairy tale like alpine landscape. 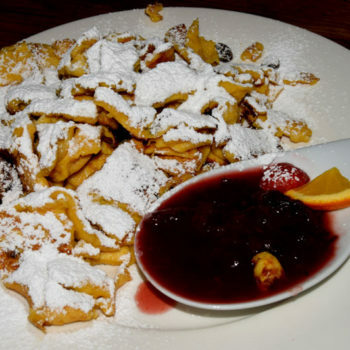 There are several stables in the area offering and we went with Fiakerwirt, which you find in the centre of the village. 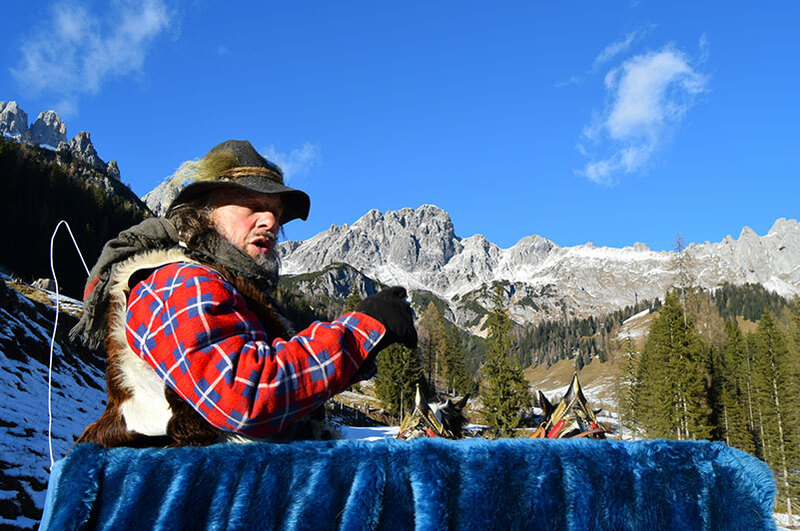 The owner Georg, is a real character and not only shared his knowledge of the surrounding nature, but also entertained us with jodeling (traditional singing from the Alps). The trip included a one-hour stop at the Unterhof Alm. 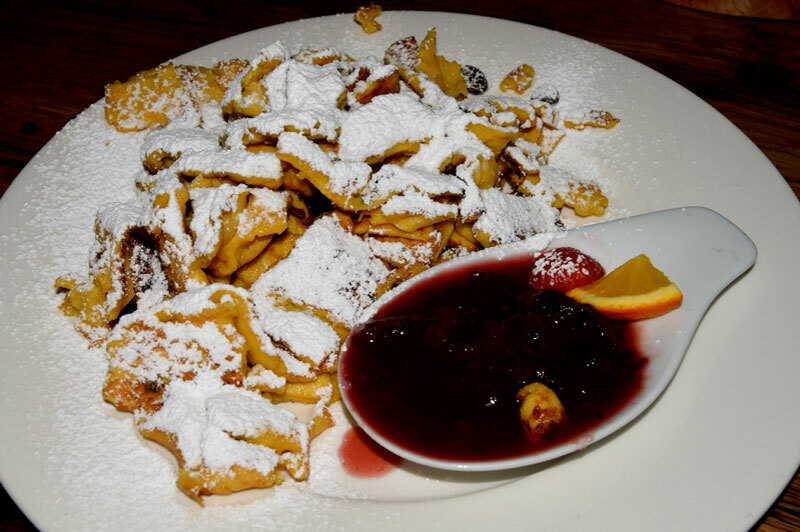 Enough time to enjoy our favourite Austrian snack Kaiserschmarrn, before returning to the village. 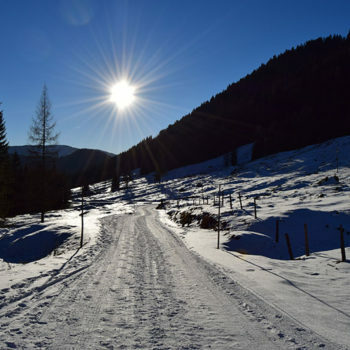 The next time we travel to Filzmoos we will definitely arrive in one of the snow richer months such as January or February. 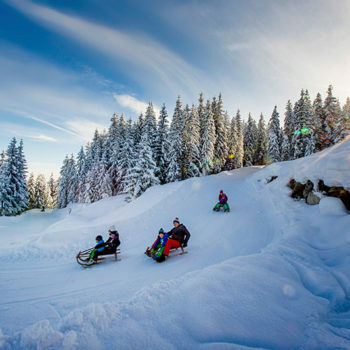 The 3 km floodlit toboggan run with an altitude difference of about 350 metres should be great fun. Not only for children, but for grown-ups as well. If you fancy hiking outside the cleared trails you should try snowshoe walking. This is a bit more strenuous, but allows you to venture out in nature and make your own footprints in the snow. 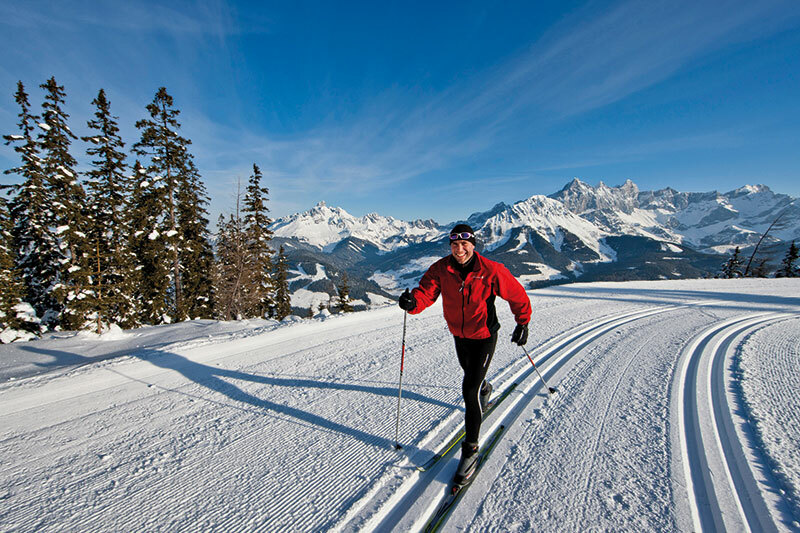 If you are up for a real challenge, why not try biathlon. Professionals introduce you to the sport of biathlon. 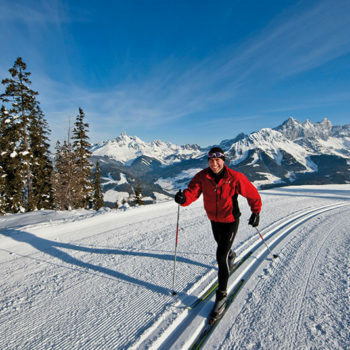 A combination of shooting and cross-country skiing. With this experience, you can watch and comment the elite in the biathlon world cup on TV with real knowledge. 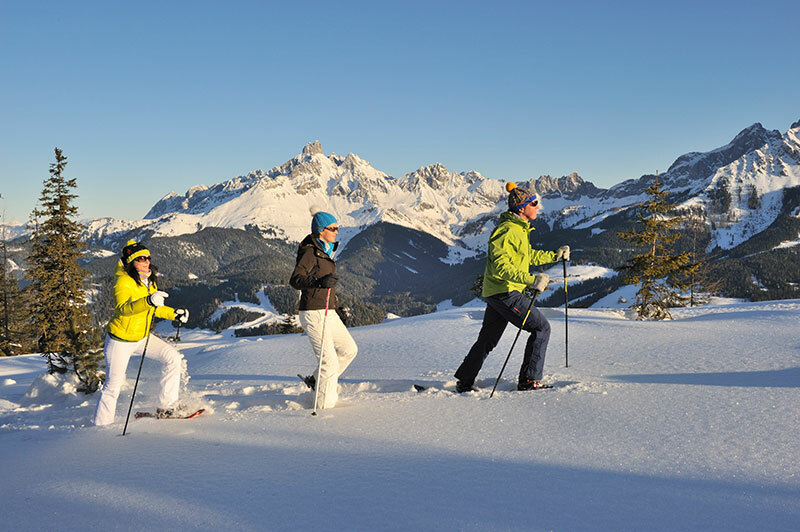 There are of course ample possibilities to ski in Filzmoos as well, no matter if you prefer going downhill or cross-country. There are a couple of alpine ski slopes on either side of the village itself. Furthermore, you also find good slopes at Neuberg, a small side valley about 3 kms west of Filzmoos. 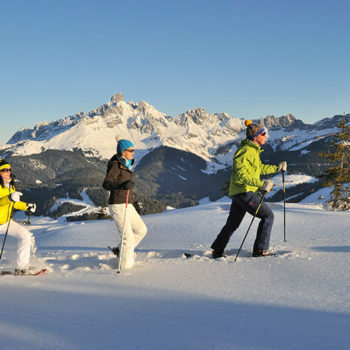 Nonetheless, if you are looking for more advanced slopes and with a greater variety, there are plenty of slopes nearby. 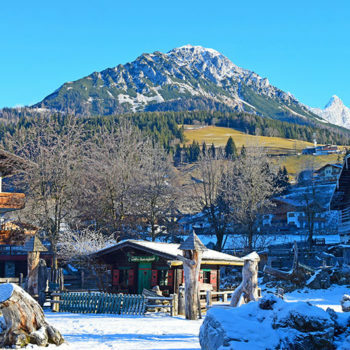 Filzmoos is for example only 22 kms from the ski resorts such as Schladming (Styria), 42 kms from Obertauern or 21 kms from Flachau (SalzburgerLand). 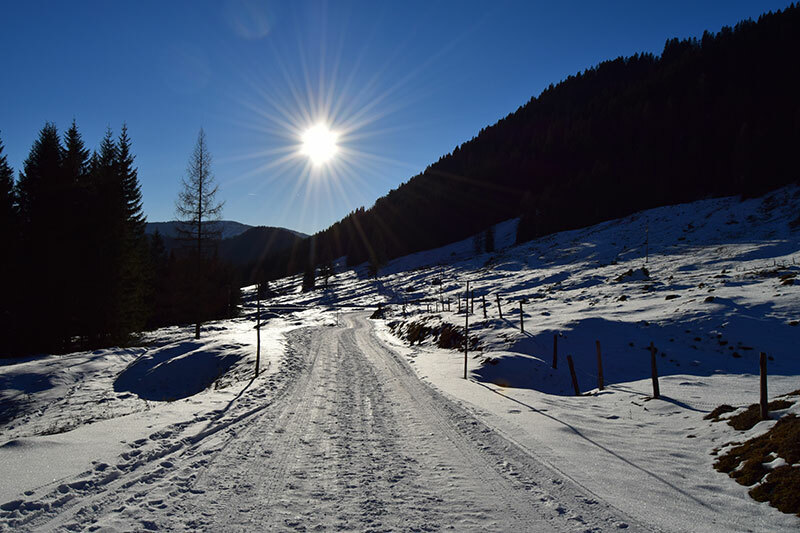 Cross-country enthusiasts will find plenty of tracks around Filzmoos to enjoy the nature or get a proper work out. 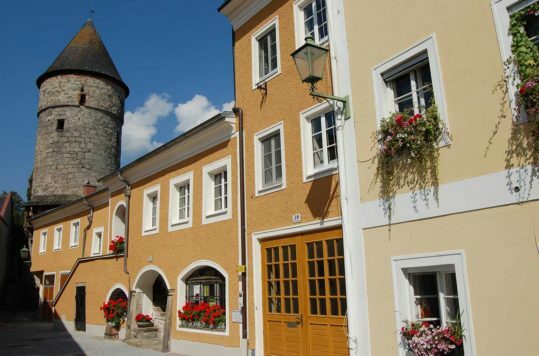 If there were such a rating, Filzmoos would come in at the top of the list in the category “Typical charming Austrian village”. 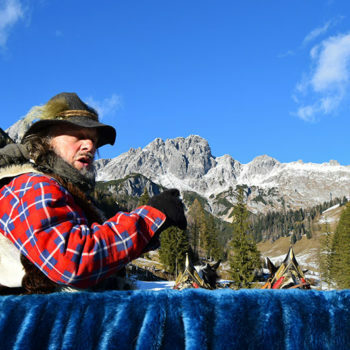 With its 1500 inhabitants, nestled in small valley on the border between Salzburg and Styria, the village has succeeded to remain true to its origins, an Alp village. Despite tourism taking over from agriculture as the main source of income, it has retained its countryside village charm. Unlike some other villages it has avoided turning into a glitzy tourist machine, that is virtually dead in the off seasons. You will find a good choice of accommodation, eateries and other tourist amenities.